Under-promise and over-deliver. That rule of thumb has underpinned many successful businesses. It's a simple premise - exceed your customer's expectations by giving them more than you promised. The T.R.A.F.F.I.C. 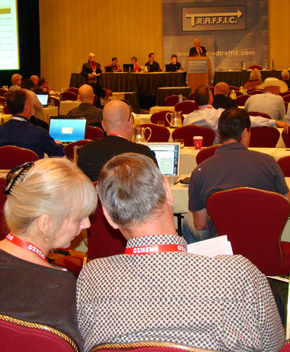 conference has thrived despite consistently breaking that rule. In fact, they've broken it clean in half by repeatedly ignoring the first half of the maxim - under promise. If you have read any of our many T.R.A.F.F.I.C. 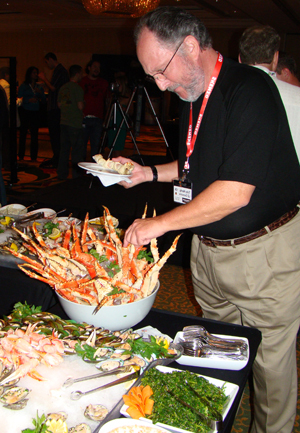 preview articles since the domain conference began four years ago this month, you know that show founders Rick Schwartz and Howard Neu always promise great things, even life changing things to those who attend their shows. They keep climbing out on the limb, knowing full well that failing to deliver would break the bough they've built their reputations on. 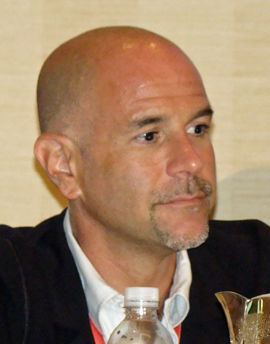 Howard Neu welcome attendees to 2008 New York show. T.R.A.F.F.I.C. series at the Brooklyn Bridge Marriott. Despite an unbroken string of successes that established T.R.A.F.F.I.C. as the conference world's luxury brand, they decided to tear up much of their playbook for this event. To separate themselves from a constantly growing pack of competitors, Schwartz and Neu made so many changes to their classic formula that some believed a "new Coke" kind of calamity was about to unfold. Moniker would no longer have a monopoly on the show's live domain auction as two additional providers, RickLatona.com and Aftermarket.com, were added to the mix to give buyers and sellers more options. The conference focus would change from PPC to a new theme, "Beyond PPC", that resulted in new speakers talking about fresh topics. More networking opportunities were built into the schedule and the show itself moved to a new venue in Brooklyn, across the river from more glamorous Manhattan where last year's New York show was held. Marriott high marks. Some thought that move alone would sink the T.R.A.F.F.I.C. ship. It didn't. Attendance was up strongly from the May show in Orlando, jumping more than 50% to 350. Broadway and Times Square were a little further away, but that wound up being a positive thing in many ways. More attendees stayed in the comfortable Marriott rather than dispersing to various downtown attractions. That produced better attendance at the seminars, networking sessions and social events - making all of those functions livelier and more productive than they have been in cities that offer a multitude of distractions that pull people away. The astonishing array of gourmet food and drink served throughout the week also insured that show goers had no complaints about moving to a new borough in the Big Apple. worked and the T.R.A.F.F.I.C. franchise was reinvigorated as a result. In the rest of this review we'll take you through conference week hour by hour to show you how they did it. As always a welcoming cocktail party kicked things off Tuesday evening (Sept. 23) at 6pm. The first thing you noticed, especially since the downturn in the general economy left questions about how many people would spend the time and money to make the trek to New York, was the sizeable crowd already engaged in animated conversation across the ballroom. 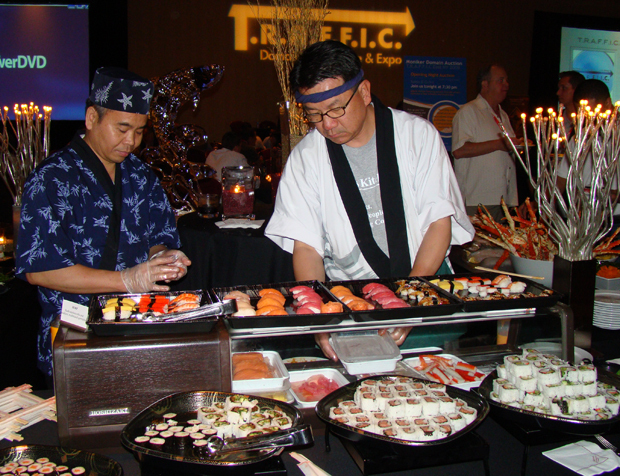 The next thing you noticed were the serving stations piled high with lobster tails, giant shrimp, sushi, rich desserts and all manner or delightful delicacies - a remarkable culinary cornucopia, even by T.R.A.F.F.I.C. 's lofty standards. At 7:30pm, while attendees were still enjoying their opening night feast, the first of the week's four live domain auctions got underway in the same room. 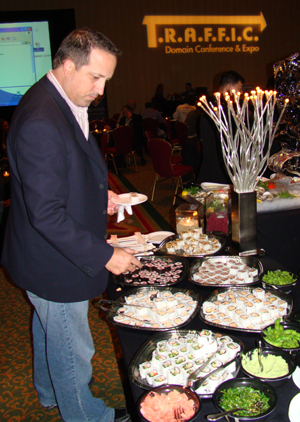 This was an abbreviated no or low reserve auction that Moniker served up as an appetizer for their main auction event that would follow two days later. The short inventory list produced close to $100,000 in sales and gave attendees a little taste of the live auction atmosphere that would be a bigger part of this week than ever before. At 9pm, industry companies were free to stage their own private events around town. 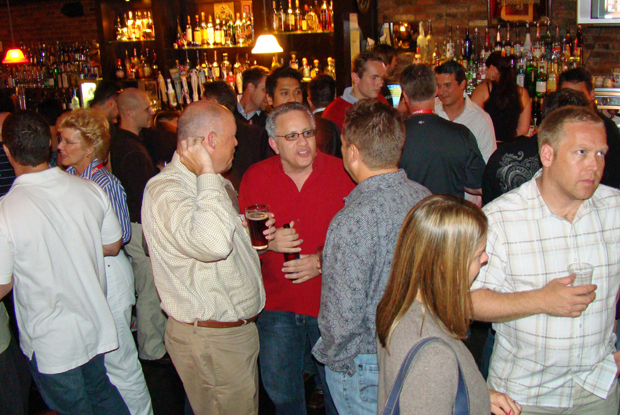 NameMedia's soiree at Brooklyn's scenic River Cafe drew the biggest crowd. 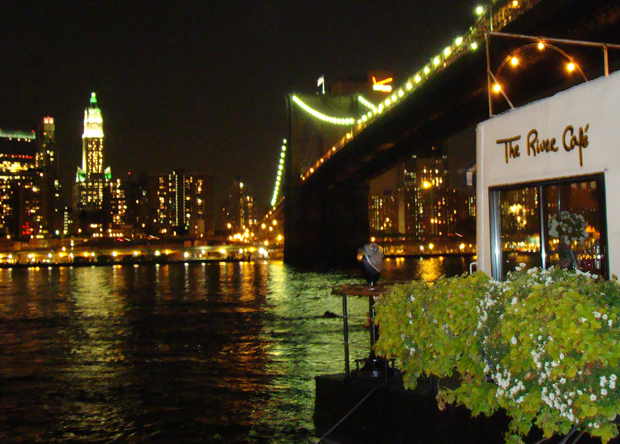 The restaurant sits at the base of the Brooklyn Bridge and offers a spectacular view of the Manhattan skyline across the East River. NameMedia's opening night party at the River Cafe in Brooklyn. The venue also presented a striking dichotomy between two different worlds. Within view, just across the river, Wall Street was in complete free fall, the center of a near meltdown in the general economy. Yet in this little cafe a stone's throw away, unbeknownst to the outside world, was gathered a small group of visionary people whose businesses were still thriving - people who were perfectly positioned to benefit mightily from the growth of the most powerful mass communications medium ever devised - the Internet. No wonder the mood at this event (and all of the others held during show week) was so upbeat. The sentiment I heard spoken more than any other was how incredibly fortunate we are to be in this business at this time in history. Rick Schwartz echoed this theme the next morning (Wednesday, Sept. 24) when he and Neu kicked off the first full day of the show with their traditional welcoming address. "There is no doubt that we are at the epicenter of history in the making," Schwartz said. "All the titans of business across the street are crumbling and here this little tiny group of domainers is becoming the next generation of "real estate" barons in the world. Domains may turn out to be the safest asset in the world. You can control them from anywhere in the world at any time - you don't have to wait for the bank to open - you can move them on a whim. They produce income and if you have good ones, the value is rising. So we have a lot to be thankful for," Schwartz noted. 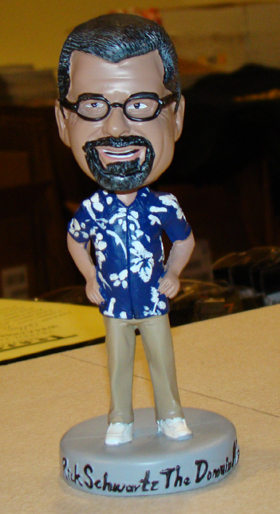 A lot of cool promotional items are always handed out at conferences, but when it comes to unique swag, you would be hard pressed to top the limited edition Rick Schwartz bobblehead dolls that attendees received Wednesday morning. The dolls were manufactured by domainer Warren Royal who runs a bobblehead business at Bobbleheads.com (now that's the kind of category killing name any domainer would appreciate!). Royal handed out 250 of the dolls at no charge to attendees. They can also be purchased through his site for $19.95. 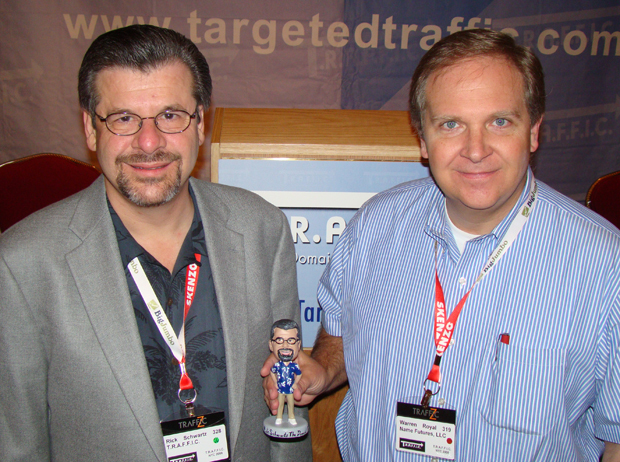 Rick Schwartz and Warren Royal (Bobbleheads.com) with the Schwartz bobblehead doll. The first seminar of the show got underway at 10:30am with Richard Chavez (Senior SEO manager for iCrossing), Vaibhav Arya (CTO for Skenzo) and Jamie MacMillan (Linkshare.com) discussing search engine optimization techniques and ways to optimize your domains for maximum returns. With interest in domain development increasing, T.R.A.F.F.I.C. plans to make SEO, content creation and affiliate programs a larger part of their mix. This session was a step in that direction. 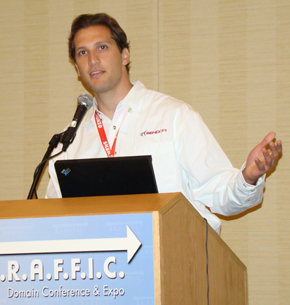 Another twist, domain trading (as an alternative to buying or selling names), was explored in the next session at 11:30 hosted by Loren Stocker who holds a portfolio of 4,000 domains. Though names were not traded during this session, Stocker explained how trading can help portfolio owners work together in a mutually beneficial way to fill in gaps in their own collections. He invited attendees to contact him through DomTrader.org where a form is available to list the kinds of domains you are looking for and those you have available for trade. Sendori.com sponsored the noon luncheon where one of their clients, John Nguyen, CEO of Tightrope Interactive, spoke about how Sendori's platform matching domain owners directly with advertisers had helped his online marketing firm secure highly targeted domain traffic that has produced excellent results for his clients. the exception of E8.com who has not yet posted details of their program. 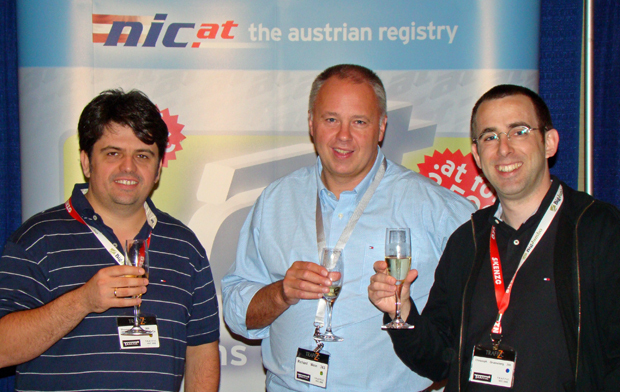 Demas, who has been buying up numerical domains this year, hinted that he had a time saving solution in the works. He was there to start building name recognition for E8.com with details to follow in the months ahead. Attendees also had a chance to meet representatives from many other domain industry companies face to face in the conference exhibit area. Many of those companies told me that this was one of the best shows they have had with respect to establishing new customer relationships. Author David Kesmodel also appeared in the exhibit area Wednesday to sign copies of his widely acclaimed book, The Domain Game. 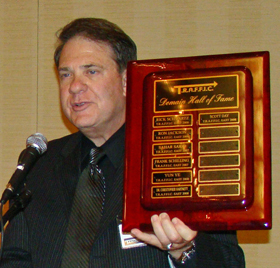 At 1:30pm, RickLatona.com became the first company other than Moniker to present a live auction at T.R.A.F.F.I.C. and Latona made he most of the opportunity by bringing in 2008 world champion livestock auctioneer Matt Lowery and his crew of spotters to run this sale. They wound up booking over $700,000, creating an impressive splash in the live auction pool for Latona, who plans to run another auction at T.R.A.F.F.I.C. Down Under in Australia Nov. 18-20. In this auction, Latona's top sales were MCC.com at $195,000, CountryClubs.com at $85,000 and DayTraders.com at $80,000. You can see a complete list of their results on Dominik Mueller's domain blog (as well as results from all of the other T.R.A.F.F.I.C. 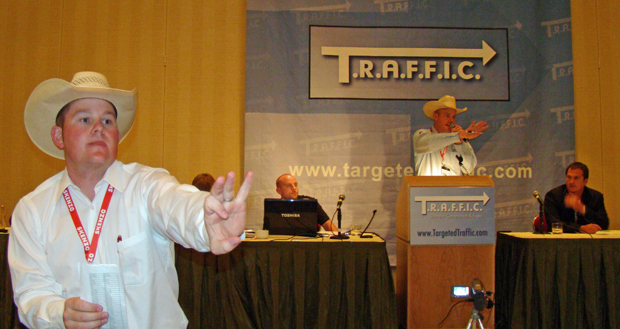 live auctions). and Rick Latona (right) at the RickLatona.com live auction. 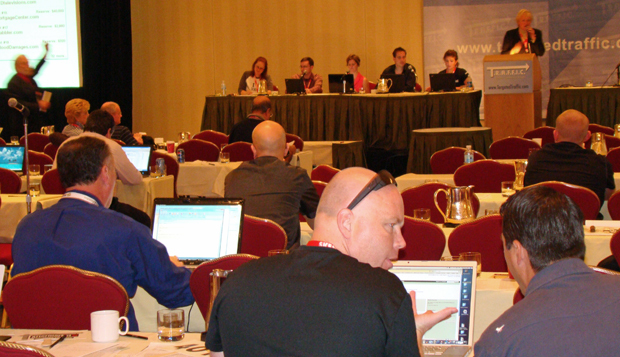 After the Latona auction, a seven-man panel took the stage in the conference room to talk about alternatives to domain parking - finding a way for domainers who rely on PPC to free themselves from dependence on Google and Yahoo. Speakers included Gregg McNair, Jamie MacMillan, Divyank Turakhia (Skenzo), Craig Rowe (WhyPark.com), Mike Feeley (Sendori.com), Aram Fuchs (FertileMind Capital) and Mike "Zappy" Zapolin (InternetRealEstate.com). Internet Real Estate Group generic domains the industry has ever seen. In addition to being exceptionally knowledgeable, Zappy has a positive outlook that always makes him a pleasure and inspiration to be around. During this seminar he focused on what an exciting time this is for our industry, even for newcomers to the space, because of the unlimited opportunity presented by the Internet. Zapolin noted that currently 21% of all media is consumed on the Internet, but only 7% of the advertising dollars are being spent there, indicating that a huge wave of growth is headed our way as that gap eventually closes. "Each additional 1% is $7 Billion, so, with Internet ad dollars expected to spike above 15% in the next few years that's another $50 Billion coming online," Zapolin said. 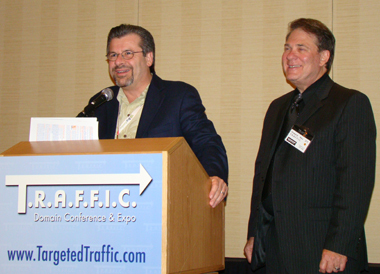 "In order to grab your piece you only need credibility and traffic. The more value you add for users (development) the more of the pie you will be entitled to." "Every company out there is cutting their ad spend away from TV, Radio, Newspaper and Outdoor and they only want to pay for performance and things they can measure, of course this is the Internet," Zapolin added. In another interesting note form this session, Turakhia, who was the subject of our September Cover Story, said that contrary to popular belief, parking companies are not profiteering at the expense of their customers. 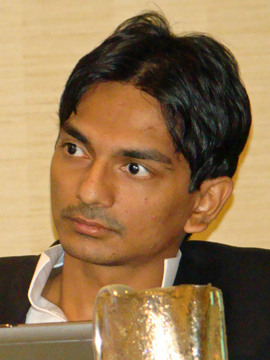 "No one is really making a killing," Turakhia said. "A lot of PPC companies are actually subsidizing PPC revenue losses by covering up to 10-15% of their customer's declines themselves." Turakhia added that due to dramatically improved parking pages that provide a better user experience we have "already migrated to an alternative to parking" that he calls "specialized search." He said the most important factor in making more money from parking is to spend the time needed to optimize your domains. Moniker and RickLatona.com, focusing on a short list of 50 domains with lower reserve prices than you usually see in live auctions. They also brought in well-known local auctioneer Jill Doherty to add a professional touch to their event. The end result was just under $150,000 in sales led by Illinois.org ($31,000), MadisonAve.com ($17,000) and StayAtHome.com ($15,000). 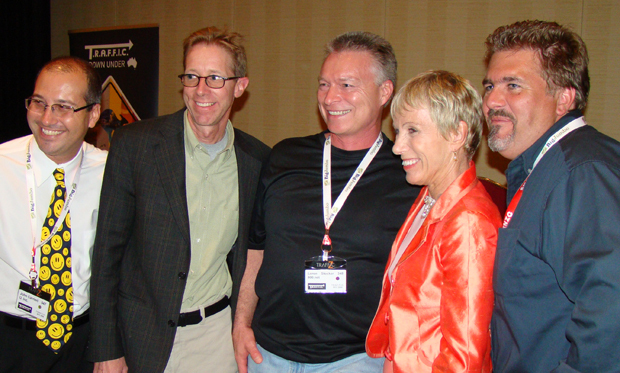 The Wednesday night dinner featured a well received keynote address from New York real estate legend Barbara Corcoran, a frequent contributor to NBC's Today Show. Corcoran was a pioneer in using the Internet to sell properties and she credited the web for helping her build a company she went on to sell for $70 million in 2001. Corcoran regaled the crowd with funny anecdotes, often sprinkling her commentary with mildly off color language that NBC undoubtedly would have bleeped out. She told the crowd that the often repeated story that the Dutch bought Manhattan from the Indians for $24 worth of beads and trinkets in 1624 was BS. In reality, she said it was the Dutch that got taken. She said when they came upon some Indians who were fishing in the area and offered to buy the land they accepted, but only because they were only visiting the area and had no ownership rights to begin with. Those Indians were typical New Yorkers! ", Corcoran laughed. With respect to domainers, Corcoran closed her talk by saying, "How lucky you are! That this point in business history (where everything is migrating to the web) happened in your lifetime when you were young enough to get it. Take advantage of what you have before you where anything is possible - Anything!" Capping the night Wednesday was the official T.R.A.F.F.I.C. Party at Brooklyn's Water Street Lounge hosted by lead sponsor TrafficZ.com. The party ran from 10pm to 2am in the old brick-walled pub located on a cobblestone street near the East River. 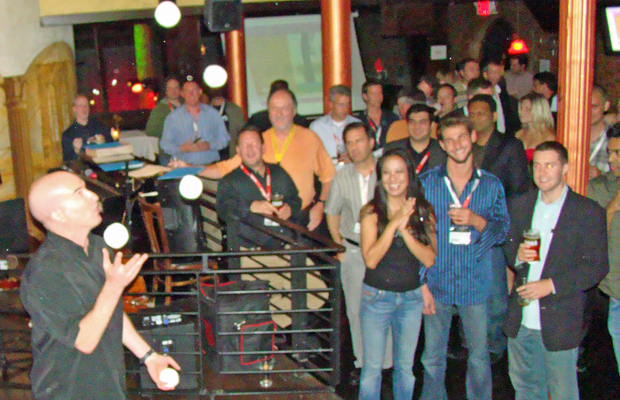 In the photo below, a talented juggler entertains the crowd.